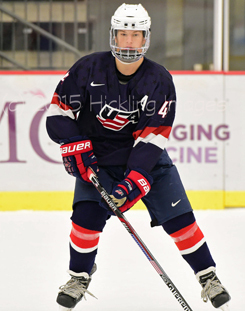 Continuing my roster preview for USA Hockey’s U18 squad for the U18 World Championships starting tomorrow I take a look at half of the teams 13 forwards and will preview the rest of the forwards and goalies in my next post. Yesterday’s blog covered Team USA’s defense. #17 Evan Barratt, C (5’11 187 lbs) – Barratt is a Pennsylvania native who is committed to play at Penn State. Prior to being selected to the USNTDP program he played his U16 hockey for Team Comcast. This past season for the U18’s Barratt posted 49 points (17g/32a) in 56 games. 65th ranked player in North America for 2017 draft by NHL Central Scouting. #10 Scott Reedy, C/RW (6’1 203 lbs) – A Minnesota native who played his Bantam and Midget hockey in Minnesota with Shattuck St. Mary and is committed to play at the University of Minnesota. 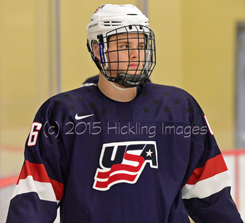 Came to the USNTDP in 2015-16. Reedy put up 41 points (20g/21a) in 53 games for the U18 team this season. Ranked #40 player in North America by NHL Central Scouting for 2017 draft. #9 Logan Cockerill, RW (5’9 163 lbs) – Michigan native who is committed to play at BU. Played his Bantam hockey with the Oakland Jr. Grizzlies and his Midget with Belle Tire. Came to USNTDP in 2015-16. This season for the U18’s posted 25 points (14g/11a) in 45 games. Ranked #214 in North America by NHL Central Scouting for the 2017 NHL Draft. 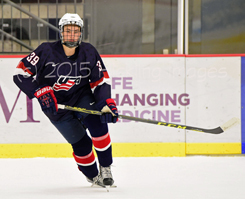 #4 Joel Farabee, LW (5’11 148 lbs) – Farabee is a native of New York and is committed to BU as part of the 2019-20 class. One of only two 2000 birth years on this years U18 worlds team. Played two years of U16 hockey with Selects hockey academy. Came to the USNTDP in 2015-16. This past season he played 43 games for the U17 team putting up 31 points (18g/13a). He also played 15 games with the U18’s posting 13 points (5g/8a). He is a 2018 draft eligible prospect and is considered a highly touted prospect in that draft class. Josh Norris, C (6’1 192 lbs) – Michigan native Norris is committed to play at Michigan. Played his Bantam and Midget hockey with the Oakland Jr. Grizzlies. Came to USNTDP in 2015-16. This season for the U18’s he averaged a point a game with 54 points (24g/30a) in 54 games. Eligible for the 2017 draft and the NHL scouting bureau has him ranked #34 in North America. 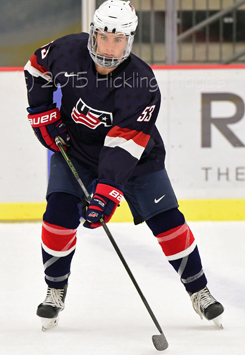 Grant Mismash, C (6’0 183 lbs) – Another Minnesota native who played his Bantam and Midget hockey with Minnesota powerhouse Shattuck St. Mary before coming to the USNTDP program. Mismash is committed to play at North Dakota. This season for the U18’s posted 53 points (23g/30a) in 58 games. Eligible for the 2017 draft and is a highly ranked prospect by the NHL Central Scouting Bureau coming in ranked #24 in North America. Jacob Tortora, LW (5’8 161 lbs) – Tortora is a New York native who is committed to play at Boston College. Like the rest of this team came to the USNTDP program in 2015-16. Prior to that he played his Bantam and Midget hockey with the Don Mills Flyers. This season with the U18’s he posted 34 points (16g/18a) in 44 games. Eligible for the 2017 draft and is the 175th ranked prospect in North America by NHL Central Scouting. I will preview the remaining forwards and goalies tomorrow as the World Championships kickoff!